By some measures, Nevada’s roads are becoming safer over time. Earlier this year, the state Department of Transportation announced that traffic fatalities fell by almost ten percent from 2016 to 2017. That same press release acknowledged that pedestrian and cyclist fatalities both rose in the past year. The number of pedestrian deaths rose by nearly one-quarter while 50 percent more cyclists were killed in traffic accidents on Nevada roads than in the year prior. [The NHTSA] defines a pedestrian as any person on foot, walking, running, jogging, hiking, sitting, or lying down who is involved in a motor vehicle traffic crash. These exclude people on personal conveyances like roller skates, inline skates, skateboards, baby strollers, scooters, toy wagons, motorized skateboards, motorized toy cars, Segway-style devices, motorized and non-motorized wheelchairs, and scooters for those with disabilities. As in Nevada, the nation’s number of pedestrian deaths from traffic crashes increased by nearly ten percent year-over-year. 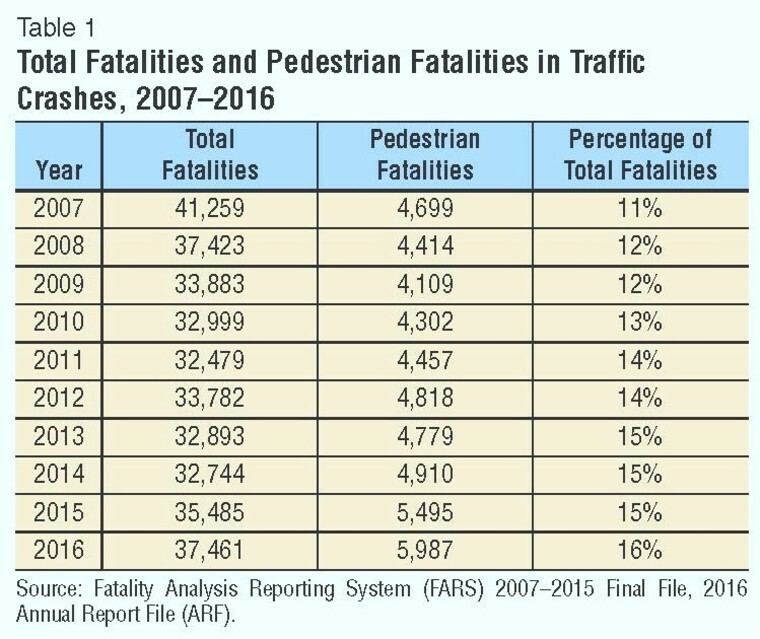 The fine-grain detail in the NHTSA’s data suggest some factors that may be driving Nevada’s ongoing struggle to contain deadly car accidents involving pedestrians. Three-quarters of pedestrian fatalities occur in urban areas, and three-quarters of them occur during darkness. One-third of those pedestrians killed had a blood-alcohol content (BAC, the standard measure of drunkenness) at or exceeding the legal limit. In Nevada, some 75 percent of the population lives in the urban sectors of the Las Vegas metropolitan area and the cities of Reno and Sparks. With the state’s 24-hour culture, nighttime activity is commonplace. And it is not uncommon for those nightly outings to be fueled by alcohol or other controlled substances, potentially impairing drivers and pedestrians alike. Indeed, Nevada is near the top of the list of states with the most pedestrian fatalities per 100,000 people. Only five other states and Puerto Rico have higher frequencies. Somewhat surprisingly, Las Vegas has a lower rate (2.05) than the statewide level (2.72). Perhaps the story there is a logical but counterintuitive one: while nighttime in an urban area is the most dangerous place for a pedestrian to be, the broad, avenues of the Strip remain garishly lit throughout the night and both drivers and pedestrians know to expect one another. In the consummate 24-hour town of Las Vegas, perhaps the normal rules for pedestrian fatalities are turned upside down. Another statistic is that children under age 14 are more likely to be killed as pedestrians than as vehicle occupants. While the split between occupant and pedestrian deaths is 84/16 overall, for children under 14 it is 80/20. Combined with the information above, it is plausible that a significant threat of fatal car accidents involving pedestrians lies in Nevada’s sprawling residential neighborhoods and affinity for rugged vehicles suited to the state’s harsh weather and numerous adventure locales. Since a culture change is neither likely nor entirely desirable, Nevadans will have to find other ways to keep the roads safe for all users. I Think I Broke My Back on the Casino Lobby Floor; it was so Slippery, Can I Sue? The US Supreme Court Gives the States Back Some Rights. A Ruling for Personal Injury Victims and those Accident Attorneys who are fighting for them.